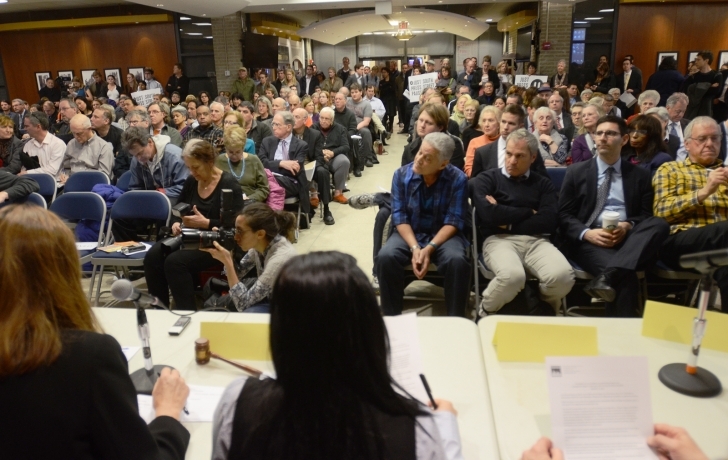 More than 200 people crowded into a public forum at Pace University on Jan. 13, most there to show their opposition to the Howard Hughes Corp.’s proposed redevelopment plan for the South Street Seaport. Many who spoke at the Community Board 1-sponsored meeting attacked the 600-foot-high residential tower the developer has proposed for the site of the New Market Building. The tower had already received vehement criticism at a CB1 meeting in November, when Hughes Corp. representatives publicly presented its development plans for the first time. Michael Sosin, a 24-year-old resident of the residential complex Southbridge Towers, near the Seaport, said that erecting “modern” buildings in the neighborhood would be a “blight” on its historic character. Apart from the tower, Hughes Corp. is proposing to restore and add a floor to the landmarked Tin Building, a historic remnant of the Fulton Fish Market where the company plans to install a food market of at least 10,000 square feet. As part of its plans, the developer would rebuild the piers and construct a new marina. A tall tower is needed to pay for it all, said Chris Curry, the executive in charge of Hughes Corp.’s Seaport projects. "That’s $125 to $150 million to get to that point before we even talk about building [a tower] on the New Market site," he said. Curry said Hughes Corp. is addressing many of the Seaport needs expressed in earlier community forums, such as preserving the Tin Building, establishing a fresh food market, creating a marina and connecting the East River esplanade through the Seaport. He has also suggested that the company could save the South Street Seaport Museum, but has offered no specifics. “It’s very important for everybody to understand the economic ramifications of the site,” he said. Andrew Breslau, senior vice president of the Downtown Alliance, said that the Alliance has yet to take a position on the Hughes Corp.’s plan, but it is sympathetic to the financial realities. Some speakers presented their own visions of the future Seaport. Michael Kramer, a lead member of Save Our Seaport, a group opposed to the Hughes Corp.’s plan, suggested preserving the New Market Building for use by the South Street Seaport Museum—and turning the Tin Building into a public school or a community center. Marco Pasanella, chair of the Old Seaport Alliance—a group formed after Sandy to promote the area’s businesses—suggested that the developer transform the Seaport into a “food capital,” featuring a “large-scale” food market, a culinary school and Food Network events. Pasanella also suggested that Seaport Museum boats might be converted into “floating hotels,” with the revenue dedicated to their preservation. Robert LaValva, founder of the New Amsterdam Market who also opposes the Hughes Corp. plan, has joined architect Gina Pollara to launch a campaign called “JustPressPause.org.” The pair want to stop the upcoming city approval process until a grassroots “master plan” is developed. That plan, LaValva said, must consider the Seaport and its structures as public assets. Following the meeting, Curry said he had taken notes and will consider the many comments.